Ukrainian Interior Minister Arsen Avakov has held a meeting with Markus Kerber, the Secretary of the Federal Ministry of the Interior of Germany, the minister said on Twitter on Thursday evening. "Collaboration between migration and police structures (particularly in the field of countering cyber crime) has been discussed with State Secretary of the Federal Ministry of Internal Affairs of Germany Markus Kerber. 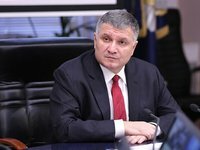 A reliable partnership promises a long history and good prospects," Avakov said.